A train carrying passengers and goods travels from Harare to Bulawayo, Zimbabwe, Aug. 6, 2018. 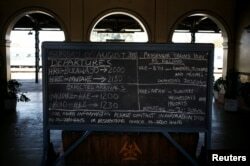 A train schedule is written on a chalk board at a train station in Harare, Zimbabwe, Aug. 5, 2018. Gilbert Mthinzima Ndlovu (R), a veteran of Zimbabwe's 1970s independence war and a security guard at the National Railways of Zimbabwe (NRZ) for 35 years, chats to his colleague in a carriage during an overnight train journey from Harare to Bulawayo, Zimbabwe, Aug. 5, 2018. Not surprising, then, that many Zimbabweans prefer to make the 440 km (273 mile) journey by bus or public taxi in around five hours than have to endure a cold overnight train ride - even if at $10 the train ride costs only half as much. The train carriages often lack lighting and water, and the toilets are filthy. The signalling and information systems are often vandalized and some tracks overgrown with grass and weeds because they have not been used in years. Last year South African logistics group Transnet won a $400 million joint bid to recapitalize NRZ and fix some of the problems, including acquiring and refurbishing carriages. A passenger travels on a sleeper train from Harare to Bulawayo, Zimbabwe, Aug. 6, 2018.